“New service development is a modification of current services and or adaptation of the service that is already offered in another geographical market.” (Edvardsson, Gustafsson, Johnson, Sanden 2000). Why is new service development so important? Today´s business life is all about competition and Innovative service is the means that companies differentiate themselves from the current intense competitive market. Companies are constantly trying to differentiate themselves from other players in market field. Previously markets have been really product/manufacturing oriented. Mainly all the tools are then developed towards this manufacturing idea so service innovation and new service development are poorly researched and understood areas. But today´s business needs to take these things into consideration in order to survive. In order to develop new ideas companies need new tools for their work. Authors of the book “New Service Development and Innovation in the New Economy” focuses on the introduction and development of new competitive services by providing practical tools through real cases for companies and developers for the process together with theoretical methods. As the new service development is multifunctional, it requires inputs and active participation from employees of many different functions on an organization. Markets are encountering drastic structural changes with a very high speed as a result of deregulation, the use of telecom and internet based processes, internationalization, strategic alliances and the advance of technology, which are the factors that made the new economy possible. The book gives good insight of new service development process by providing the authors’ model and goes through each stage of the process in detail. After explain each stage, it provides the supporting methods to implement the process and at the end summarizes the whole discussion of the book by suggesting what the prerequisites for world class new service development and innovation are. The process begins with idea generation and then continues to the allocation of the needed resources and form the project organization. Once the allocation of the resources and formation of groups are done, and then we move on to the service design phase where the service concept is developed into a service. Service deployment and implementation comes at the final stage of the process. The authors use Booz, Allen and Hamilton (1982) that presents categories of service development as their framework. The six categories of new service development are new to the world services, new service lines, additions to existing service lines, improvements and revisions to existing services, repositioning and cost reductions. 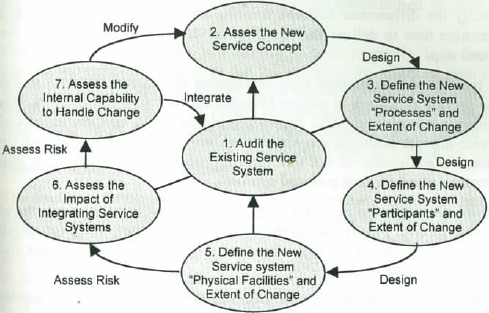 As the authors describe it “an essential part of what is called new service development is a modification of current services or adaptation of services that already are offered in another geographical market” (Edvardsson, Gustafsson, Johnson and Sanden 2000, P 63). However, it is argued in the book that there is a lack of radical innovation in services for two reasons according to von Hippel, Thomke and Sonnack (1999). These reasons are because of companies’ strong incentives to focus on the short term and the difficulty to get a patent for services. The most useful ideas from the book those captured our attentions are discussed in this blog. We chose these contents because they give step by step introduction on how to develop new service and be innovative in the process. Before going through the whole process of new service development the book describes what the service logic characteristics have been identified that differentiate services from traditional manufactured products. The characteristics are immateriality, co-production, customer as a producer and heterogeneity. From these characteristics the book emphasizes the customer participation in the service story. It identifies customers as an important participant and co-producer. The customers’ involvement is increasing in terms of identifying, creating, extracting and exchanging value and that the service quality is observed when they make use of the service. If you are not testing your idea with a customer first it can be that your idea will not survive. How you can be sure that customer will get something positive out from your idea? What is this service that customers are realizing? The prospects of or prerequisites for the service explains the customer’s perception of a service is dependent on his or her perception of the outcome and the process which are also dependent on the prerequisites in the form of resources. The overall quality of the service relies on the quality of the resources and the organization that produces the service. The service prerequisites include there major parts in the authors’ frames of reference that are the service concept, the service system and the service process. The service concept is identification of customers’ needs and how these can be satisfied. The resources needed to for the service process is called the service system. The service process is defined as “a chain or chains of parallel, sequential, overlapping and/or recurrent activities, which are necessary if the service is to be put in practice”. But what about other people then? The book argued that even though customers are vital, so are also the stakeholders, the management and the internal communication. It is vital that the customer knowledge goes through the whole organization. Why? Simply because that it is organization´s responsibility to build up required resources and structures in order to get the service process ongoing. By using different tools presented in the book like Policy Deployment, management can implement guidelines, supervise and monitor how to deliver the new service development process sufficient. The figure below shows the seven steps of framework concerned mainly with the implementation phase, but also deals with the service design issues. In the age of New Economy, the companies that will survive are those who truly understand their customers. But no one is perfect already. Companies must understand that it is important to develop skills on their own to understand their own customers. This way they will survive as winners. Referring back to the authors’ model of the new service development process, the book provides supporting methods and practical tools for each phase and for learning customers. These methods are meant to help companies communicate with their customers or within project teams. 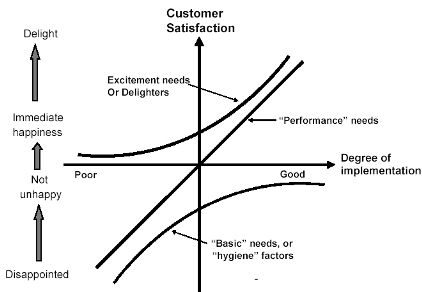 From a good selection of different tools we want to present the one that intrigued us most, the Kano model. As an example we give you hairdresser. When going to the hairdresser your aim is to get your hair, let´s say as an example, dyed red and cut into the right model. After a few hours you will expect to see through the mirror this kind of image. But if you see your hair cut too short and black, you have not got what you were expecting. The service provider did not fulfill your basic attributes. Also you might tend to go to same hairdresser again and again, because you know that the dresser is always on time and will do the job you prefer, the things you want from the service. Then your performance attributes are fulfilled. But how the provider can tease you to come again and again? For example by serving coffee and pastries during the hair-cutting, or giving free samples from different products. Surprise and delight attributes are the keys of taking the customer service even further. The authors argue that there are different success factors that companies need to focus on in order to become World-class service developers. Just to mention a few: understanding of the customer, create a customer-centric service culture and strategy, involve the customer in the development process, appoint multi-teams, manage internal and external communications, and take on holistic approach. Almost every of these factors are related somehow to the customer. And by also broadening up the concept from external customers to internal customers, companies will get vital knowledge and information needed when developing new ideas and service concepts. When thinking about today´s world, it seems that companies are acknowledging the importance of customer, but do not know how to include customers in the process. As a critique, though the book emphasizes customers’ participation is very important in the new service development; it doesn’t provide enough tools to use except Dialogue. It is clear that only dialogue is not a sufficient tool to get customers involved in the process. Booz, Allen & Hamilton (1982) New Products Management for the 1980s. Chicago. 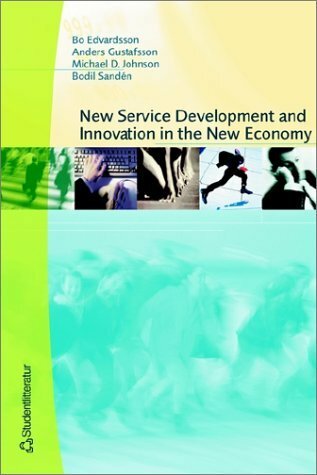 Edvardsson B., A. Gustafsson, M. D. Johnson & B Sandén (2000), New Service Development and Innovation in the New Economy. Studentlitteratur, Lund. von Hippel, E., S. Thomke and M. Sonnack (1999) “Creating Breakthroughs at 3M”, Harvard Business Review, September-October, pp. 47-48.